Continued humiliations and defeats, at the hands of Stephen Harper, has made the Liberals, more organized, open and accessible than ever before. What has always impressed me about them, is their strong will to survive, triumph and ultimately, win. Trudeau has that mojo. To be fair, all elections are important. However, the upcoming federal election in one of the most important referendum like election in many generations. There are three party leaders with a realistic chance of being the prime minister. The NDP is offering a moderate vision that wants to reduce taxes, protect human rights, and pay down deficits. The Liberals, are presenting us, a rejuvenated party, with a progressive vision, that protects our safety nets, build infrastructures, and embrace the once proud tradition of a generous and responsible Canada to the world. The Conservatives, are presenting a perspective that is backward, with a smack of xenophobia and fear at its core that it mirrors the vision of the discounted and neglected perspectives of Ezra Levant and Tarek Fatah. Tragically, the Prime Minister, has also created a two-tier Albany Club-like membership of our Canadian citizenship. I have intimately been exposed to the three traditional parties in the past. While recognizing the need to have the NDP voice in the House of Commons is important, I came from my experience knowing they were too incompetent and fringe to ever form government. The party can still have a role in our politics, as it has in the past. Tommy Douglas brought the idea of Medicare to the House of Commons, Stanley Knowles advocated for housing, and David Lewis, while given little credit, became the true architect of Canada's multiculturalism. Thomas Mulcair is an impressive Tony Blair-like leader. He is no Tommy Douglas. He is one that admires Margaret Thatcher. As a leftist party that has never governed Canada federally, I wonder why they are not apologetically progressive and instead try to apologize the misdeeds of previous governments. I salute their principled stand against Bill-C 51. But on a slew of important issues, they fail to embrace the same passion and advocate for better ideals from the left, without sounding too much like either Ronald Reagan or Ralph Klein to appease. I joined Stephen Harper's Conservatives in 2005, because I believed the party needed a chance to govern. After a decade of Liberal majority rule, I believed electing them would help reduce the western alienation sentiment I felt was our reality. I was wrong. The party of Stephen Harper, is a narrow-minded, neo-conservative party, content with the fact that destroying the fabric of our citizenship and gutting down public institutions is the way to go. I do not like that. That is not the Canadian way and that is why I no longer support them. I left the Liberals in 2004, having been turned off by the arrogance of the party. I was the lone elected Sheila Copps delegate from Ottawa South at the Liberal convention that elected Paul Martin as Leader. I was saddened at how the Martin campaign alienated most of us. As Copps' supporters such as Ian Capstick moved to the NDP, I moved to the right. Continued humiliations and defeats at the hands of Stephen Harper has made the Liberals more organized, open and accessible than ever before. What has always impressed me about them, is their strong will to survive, triumph and ultimately, win. Trudeau has that mojo. Let it be known, the reasons Stéphane Dion and Michael Ignatieff were defeated, was not because they were inferior leaders, but because, they were not able to attract the resources to respond to Harper's Republican-like political attacks and bring in worthy candidates to its rooster. Let me tell you why I support the Liberals under Justin Trudeau. Not only has Trudeau managed to raise untold resources for the party, but he has managed to attract, impressive candidates. No longer is the party the natural home of the elitist -- the children of Saul Rae, Romeo Leblanc and William Frank Morneau -- but also self-made successful immigrants such as the talented, gifted and passionate Ahmed Hussein in York South-Weston; one time Ugandan refugee and inspiring human rights defender, Arif Virani in Parkdale; and Salma Zahid from Scarborough Centre, who rose from delivering take-out South Asian cuisine in Regent Park to serving in the Deputy Premier office of George Smitherman ,and now she's a candidate for the House of Commons. These are impressive Canadian immigrant success stories that are the norm of the Liberal Party today and something that would be hard to emulate in Stephen Harper's Canada. To top that, the Liberal party under Justin Trudeau has the most balanced, thoughtful and progressive vision for Canada. The party is one that can protect public institutions, make a generous gesture to refugees, protect the environment, and finally, advocate for peace in the world. 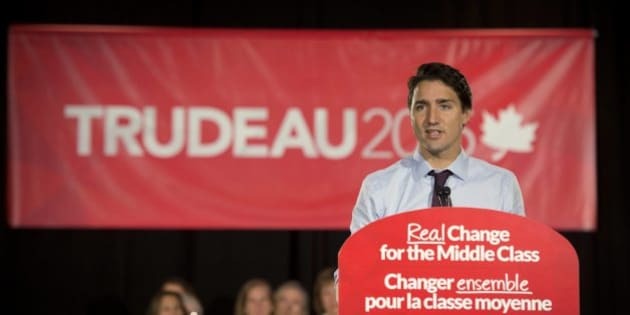 I believe Trudeau's promise that the party would indeed tweak Bill C-51, in order to embrace their Charter of Rights and Freedom tradition rather be against human rights. The party should never be arrogant to its potential supporters, and would only be wise to hear the voices of unhappy Liberals, such as Andray Domise. It is and should be a big tent political institution. At its best, it has always been that way, as it has welcomed important public servants such as Bob Rae, Glen Murray and Chris Axworthy of Saskatchewan from the Left; and Scott Brison, Keith Martin and Bill Casey from the Right to its ranks. We need a new Prime Minister in Ottawa. We should reject fear and ignorance in Stephen Harper and with the Conservative Party of Canada and embrace progressive, moderate and better vision in Justin Trudeau and the Liberal Party of Canada on October 19th.